Brilliant ruby black color. Fruity, herbal aromas and flavors of chocolate mint, eucalyptus, and pomegranate chutney with a satiny, vibrant, dry-yet-fruity medium-to-full body and a seamless, delightful, medium-long finish with accents of spiced cherries with silky, chewy tannins and light oak flavor. A delicious, fruity, herbal cabernet with lots of stuffing. Bottom Line: A delicious, fruity, herbal cabernet with lots of stuffing. 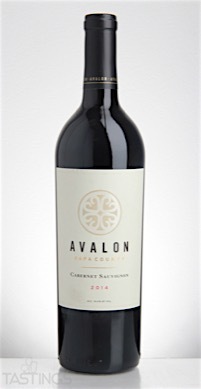 Avalon 2014 Cabernet Sauvignon, Napa County rating was calculated by tastings.com to be 92 points out of 100 on 9/24/2016. Please note that MSRP may have changed since the date of our review.